Since the early 2000s, there has been much talk about the “nuclear renaissance” — the expected revival and expansion of the civilian nuclear energy industry. The idea has largely been kept afloat by industry efforts to promote nuclear energy as a necessary part of global climate change mitigation efforts, as well as the ambitious plans made by certain countries to greatly expand nuclear power (China, notably). The problem is that hard facts show no evidence of a revival… at all! In fact, nuclear energy’s heyday was way back in the mid-1980s, when the world saw net gains of between 20 and 30 reactors each year. In comparison, in the last five years there has only been an average net gain of 4.5 reactors per year. In terms of global production, nuclear energy peaked in 2006, at 2,660 TWh — today nuclear is producing 7% less electricity! The story for nuclear’s share of global electricity production is even worse. 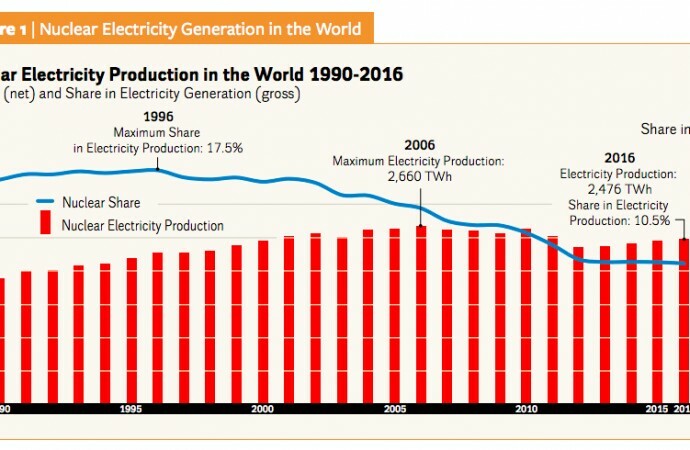 That figure peaked in 1996 at 17.5%; today nuclear only provides 10.5% of the world’s electricity — a decline of 40%! Clearly, there is no renaissance. If anything, the long-term trends show early signs of decline. These are some of the key messages of the World Nuclear Industry Status Report 2017 (WNISR) — launched in Canada last week at the University of Ottawa, in an event co-sponsored by the Centre for International Policy Studies and Smart Prosperity Institute. The event featured keynote speaker Mycle Schneider, Lead Convening Author and Publisher of the WNISR, with two discussants who contextualized these trends for Canada’s energy and climate policies — Ralph Torrie of Torrie Smith Associates, and Catherine Abreu of Climate Action Network Canada. Schneider spoke of how nuclear energy is exceptionally expensive (relative, in particular, to renewables), how nuclear projects are prone to cost overruns and eventual abandonment, and how most “nuclear nations” have long ago seen the peak of nuclear production (including Canada, which today does not produce as much as it did in 1994). Further, the argument that nuclear energy is a necessary component of climate mitigation was thoroughly debunked by all three speakers, in part because reactor construction projects are so notoriously slow (it takes, on average, ten years for a reactor to be built) and expensive, that a much cheaper, quicker solution with free fuel is readily available in renewables. You would be forgiven for wondering whether this is all just a manifestation of the “Fukushima effect” — a sudden but temporary downturn since the 2011 meltdown in Japan. But you would be wrong. Although the industry’s lead lobby organization, the World Nuclear Association, paints an image of growth, particularly since 2011, nuclear’s slide in global output began over a decade ago. Just look at the financial situation of a number of global nuclear giants — including Japan-based TEPCO (operator of Fukushima-Daiichi) and Toshiba, German-based RWE and E.ON, and French-based EDR and AREVA. Many of these companies are facing crippling debts or bankruptcies, but most importantly their share prices started to plummet back in 2007/08 — years before the Fukushima disaster. While global investment in nuclear energy has ranged between $10 and $50 billion US (per year) over the last five years, investment in renewables has ranged between $240–$310 billion US (per year) over the same period. Finally, you would also have been forgiven for thinking that nuclear development — however expensive or slow — is nevertheless needed as a counterpoint to renewables for those times when the sun doesn’t shine and the wind doesn’t blow. This argument has been made by many pro-nuclear environmentalists, who lament how the shuttering of nuclear power plants leads to more gas-fired plants. But yet again, the speakers at the WNISR launch were unanimous in suggesting that this idea too is wrongheaded. Unlike the 20th century, where the model was based on a few large utilities cranking out tons of baseload power at all hours of the day to satiate wanton consumption — for the 21st century, we are working on smart grids, smart generation, and energy efficiency. Tomorrow’s model is thus diffuse and decentralized, with countless nodes of generation and storage located all throughout the network, and it is “responsive” — in generating (or releasing, from batteries) electricity when and where it is needed. The irony in the pro-nuclear argument is that technological innovation is touted as the best way to make nuclear safer, cheaper, and quicker to build, yet brushed aside for the problems of energy storage and grid transformation. The WNISR launch was certainly enlightening, but it sure left many audience members confused about another report launched the same week — the Government of Ontario’s Long-Term Energy Plan (LTEP). Despite its decades-old nuclear power plants, Ontario is spending billions of dollars refurbishing them over the next two decades. According to one independent assessment, these expenditures on nuclear have caused Ontario’s electricity prices to skyrocket. Meanwhile, another report from 2016 discusses the significant economic benefits to be gained from decommissioning Ontario’s nuclear power plants today. As Canada’s main driver of nuclear development, Ontario seems to be headed in the wrong direction. If Ontario truly wants an affordable, low-carbon, flexible electricity grid, it may be time to jump off the nuclear renaissance bandwagon. To learn more, both the video and the PowerPoint from this CIPS event are also available.